Original rules proposed by the NJ Department of Environmental Protection for Agricultural Water Usage Certification required metering irrigation pumps for monitoring water consumption. The compromise settled upon, as an alternative to meters, requires that irrigation users keep monthly logs of water use by recording the number of hours each pump runs each day. Logs can be as simple as recording hours pumped in a notebook or on a calendar, from which monthly water usage can be calculated for mandatory annual reporting. 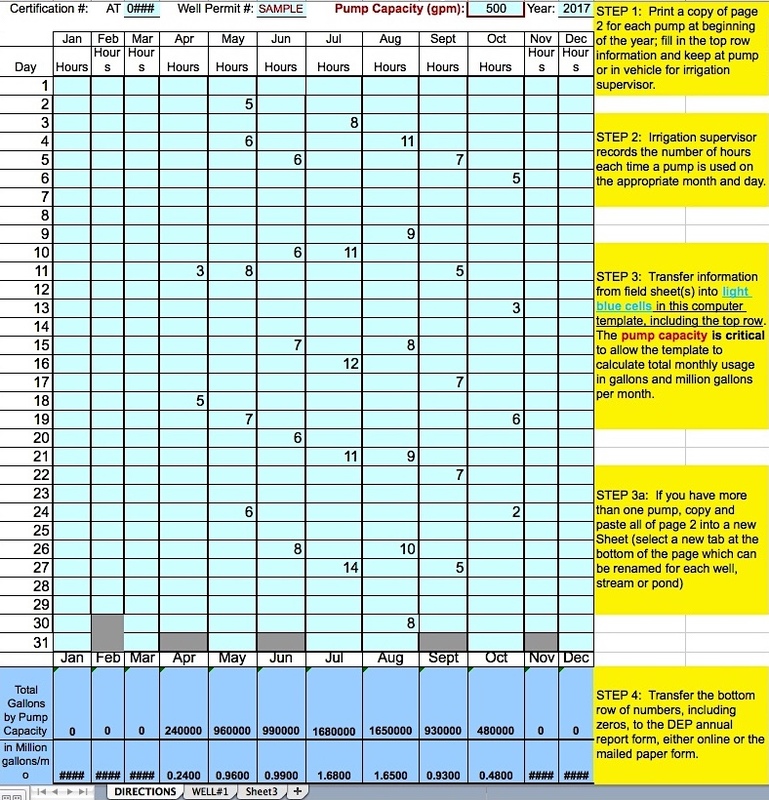 The Irrigation Pump Log provided here is a spreadsheet template that provides both a simplified recording form (that can be printed for each pump and placed at the pump or in the vehicle used by your irrigation manager), and a calculating form that allows data from the field log to be transferred into the computer file which then automatically calculates annual reporting figures. The file, which requires Microsoft Excel (enable editing), can be downloaded and opened. Selecting the print function will print only the required page to use for each well. Print multiple copies if you have more than one well to monitor. When transferring field data into the spreadsheet, start by selecting a new tab at the bottom of the screen for each well (already set up for Well #1, but needs to be copied for additional wells). Then transfer the data from the field sheets, including the information about each well at the top of the page. It is critical to put in the pump capacity as that is needed for calculating the monthly water use (if you put in all the hours and the monthly use reads ‘0’, check that the pump capacity cell is filled correctly). Questions or suggestions for improving this log can be directed to Atlantic County Agent Rick VanVranken (vanvranken@njaes.rutgers.edu).